We develop an optimal estimation (OE) algorithm based on top-of-atmosphere reflectances observed by the MODIS satellite instrument to retrieve near-surface fine particulatematter (PM2.5). The GEOS-Chem chemical transport model is used to provide prior information for the Aerosol Optical Depth (AOD) retrieval and to relate total column AOD to PM2.5. We adjust the shape of the GEOS-Chem relative vertical extinction profiles by comparison with lidar retrievals from the CALIOP satellite instrument. Surface reflectance relationships used in the OE algorithm are indexed by land type. 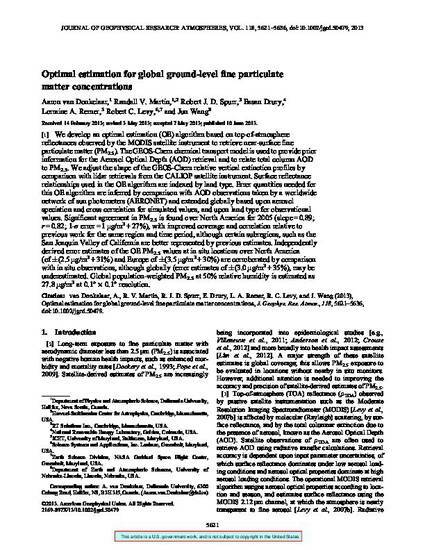 Error quantities needed for this OE algorithm are inferred by comparison with AOD observations taken by a worldwide network of sun photometers (AERONET) and extended globally based upon aerosol speciation and cross correlation for simulated values, and upon land type for observational values. Significant agreement in PM2.5 is found over North America for 2005 (slope = 0.89; r = 0.82; 1 error = 1 µmg/m3 + 27%), with improved coverage and correlation relative to previous work for the same region and time period, although certain subregions, such as the San Joaquin Valley of California are better represented by previous estimates. Independently derived error estimates of the OE PM2.5 values at in situ locations over North America (of ±(2.5 µmg/m3 + 31%) and Europe of ±(3.5 µmg/m3 + 30%) are corroborated by comparison with in situ observations, although globally (error estimates of ±(3.0 µmg/m3 + 35%), may be underestimated. Global population-weighted PM2.5 at 50% relative humidity is estimated as 27.8 µmg/m3 at 0.1◦ x 0.1◦ resolution.